Sometimes you never know which Flyers team is going to show up for a game. On Thursday night at the Wachovia Center, the Flyers played one of their best games of the season in shutting down the Rangers, 2-0. With an excellently executed defensive game, the Flyers allowed very little in the way of opportunities for the Blueshirts and stifled the Rangers in the neutral zone with what looked like a part lock and part trap that prevented any Rangers’ speed and which forced turnovers. The Flyers are now 10-3-1 since a dismal loss to Florida on December 21. Hopefully, this is the team that we’ll see the most of for the rest of the season. Some interesting sidelights occurred during the game, with Dan Carcillo fighting Rangers leading scorer and resident pacifist, Marian Gaborik. During a shoving match by the Flyers’ net, Carcillo grabbed Gaborik away from the scrum and after they tugged at each other for a few seconds, a fight ensued. After the game, Rangers’ coach John Tortorella questioned Carcillo’s “honor” for going after Gaborik. Rangers’ writers and bloggers have also picked up on Carcillo’s post-game comment that he was “licking his chops” in going after Gaborik and denounced Carcillo for doing so. They should re-read his comment. Carcillo said that after they had been shoving, he was surprised that Gaborik dropped his gloves and was “licking his chops” at the prospect of fighting him. The New Yorkers have misrepresented those comments to indicate that Carcillo was looking to fight Gaborik in a premeditated fashion. During the scrum, Carcillo did appear to look to grab Gaborik, but he made no move to begin fighting him until after Gaborik dropped his gloves and began throwing a punch. During the post-game press conference, Tortorella was asked why no Ranger came to the aid of their star player by New York Post writer Larry Brooks. A good question, since you really can’t let a non-fighter star player get beat up by another team’s tough guy. Now, Tortorella hates Brooks and their current feud goes back to 2007. So the question led to an entertaining exchange between the two. Agitator Sean Avery did seek out and fight Carcillo in the third period for one of his few contributions to the game. The Rangers appeared as punchless overall in the game as they did while their leading scorer was getting pounded. Can’t see this team making the playoffs. A pretty cool video put together by my nephew! Leighton or Emery vs. Capitals? 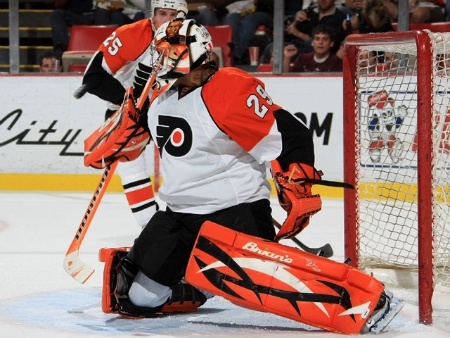 With number one goalie Ray Emery recovering from abdominal surgery and backup Brian Boucher injuring his finger, the Flyers picked up journeyman goalie Michael Leighton off waivers from Carolina as a temporary fill-in. Surprisingly, Leighton got hot and went 8-1-1, fueling a Flyers turnaround from a dismal month-long slump. Now with Emery healed and ready to go and Leighton losing to Toronto on Thursday, do they stay with Leighton or give the job back to Emery? Leighton couldn’t really be faulted for the loss against the Leafs but you’ve got to figure that Emery is expected to be the goalie for the stretch run and playoffs (if we make the playoffs). On the other hand, if Leighton is still the hot guy and we need points, maybe he stays in net for now. And does a possibly rusty Emery go in against Ovechkin and company? It will be interesting to see who gets the start and how the goalie situation plays itself out over the next couple of weeks. It appears as though the Penguins lack of sportsmanship, which is all too evident on the ice, also runs through the organization all the way to the television production department. As reported in the Philadelphia Inquirer by Flyers’ beat writer Sam Carchidi, an NHL executive indicated that replay officials in Toronto were not given the proper replays by Fox Sports Pittsburgh when Simon Gagne appeared to score in last Thursday’s game. Gagne’s rebound shot appeared to be carried into the net by goalie Brent Johnson and then pushed back out. Ruling no goal on the ice, the ref went to a replay decision. Officials in Toronto called it no goal due to “inconclusive” replay evidence. There were about three different camera angles available on this play, one of which showed the puck over the line. However, this angle was not sent to Toronto until after the no-goal decision was made and the puck was dropped. The Flyers were using the Pittsburgh feed and could not send their own video. Add cheating by its television crew to the diving, goalie-crashing, and ref-whining that has become the expected unsportsmanlike behavior of the Penguins. Further, the NHL should take action against the Penguins as a result of this conduct. With questionable calls by the refs often going against the Flyers and already calling the league’s integrity into question, the NHL does not need this sort of revelation that teams’ television crews will be allowed to withhold certain replays of disputed goals because they appear to go against their team. This news is just disgusting and another reason to hate the Evil Empire in Pittsburgh. Things are finally looking up in Flyerland as the team has gone 7-1-1 in its last nine games, including a wild 7-4 victory in Pittsburgh. They are scoring goals again and, with everyone healthy, have four solid lines to roll each night. It appears that new coach Peter Laviolette’s system is taking hold and the players have grasped it and are executing it well. Jeff Carter has found the net and is playing harder (maybe he heard the trade rumors) and goalie Ray Emery is healed from his abdominal surgery and is ready to play. Hold on, though, because third string goalie Michael Leighton has gone 7-0-1 in his last nine starts (one no-decision) with a .931 save percentage in those games. 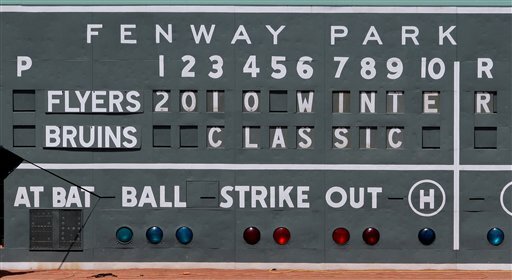 With the team playing well of late, we may have legitimate hope that they will make the playoffs. In the competitive Atlantic Division, they’ll have to continue their recent torrid play, but wow, they’re only ten points behind the Penguins with two games in hand. The win against the Pens may be the most significant of the season in terms of building the team’s self-confidence. Think back to when this tailspin started. The Flyers were 12-5-1 when they went into a game agianst potential Cup finalist San Jose and lost. It was as if the team began doubting itself and its ability to beat the upper-echelon clubs and just gave up on itself. Now with a new, fiery coach, an aggressive system that fits its players, and success against a top team, the Flyers may be poised to meet expectations after all. It should be a very interesting second half. Jeff Carter looks to make a pass. I really hope it didn’t go down like that, but one has to wonder after seeing the two marginal penalty calls against the Flyers late in the game and in overtime on which the Bruins scored power play goals, overcoming a 1-0 deficit and winning 2-1, in a game in which they were largely outplayed. Kimmo Timonen, on the ice, slid into Zedeno Chara in front of the Flyers’ net and was called for tripping. Chara is such a big oaf that I think a gust of wind could have knocked him off his skates. Give Mark Recchi credit for being so good in front of the net as he deflected a point shot past Michael Leighton for the tying goal. In overtime, Danny Briere was whistled for taking down a Bruin behind the net – a really questionable call – and Marco Sturm deflected a shot by Patrice Bergeron for the winner. Bergeron made a great play by spinning away from Mike Richards in the left circle and getting the shot away. The Flyers played a very disciplined game and had only one other minor whistled against them until the two marginal calls were made, which essentially decided the game. Additionally, the Bruins had too many men on the ice just prior to the winning goal with six – two more than were legal at the time – and this was ignored, which makes things look even more questionable. Don’t blame the refs entirely, however. The Flyers had numerous opportunities to score but couldn’t finish, which is becoming an all-too-familiar soundtrack for this team. Aaron Asham and Claude Giroux missed on breakaways, Jeff Carter couldn’t convert on a partially open net from in close, and Danny Briere had the game on his stick in overtime but fanned on an open net. Maybe the ice provided some difficulty, but this team is becoming notorious for not putting away opportunities. In fact, you could say they would have been shut out except that Bruins’ goalie Tim Thomas was busy cross-checking Scott Hartnell in front when Danny Syvret’s first NHL goal slipped past him from the point. On the positive side, the Flyers played strong defensively and cycled the puck down low very well. They outplayed Boston for almost all of the game, until the late power plays. They were disciplined and goalie Michael Leighton continued his strong play. The League did a good job with the event and it went off without any major glitches. 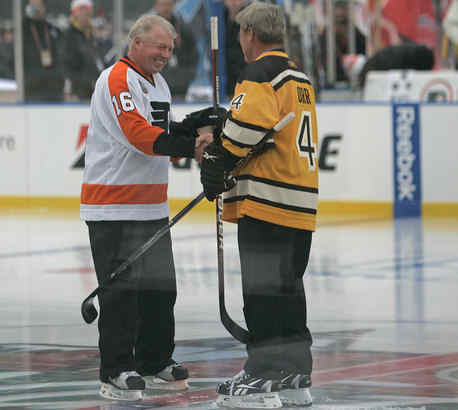 It was great seeing Bobby Clarke and Bobby Orr facing off before the game. Those two had many great battles in the 70s and are the epitome of their teams. It was a good event and a good game but unfortunately marred by the officiating at the end. 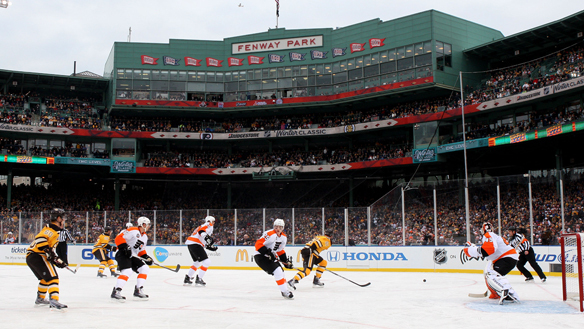 The Flyers are getting ready for the NHL Winter Classic game against the Bruins at Fenway Park. Riding a four game winning streak after a 6-0 pounding of the Rangers on Wednesday, the Flyers may be starting to come around under new coach Peter Laviolette. It looks like they may be grasping his puck pursuit system and may be better conditioned to play it. 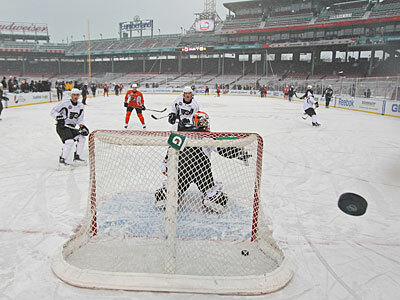 The team practiced at Fenway on New Year’s Eve in what was a festive atmosphere. Let’s home they can keep up the momentum despite the distractions of the big event.